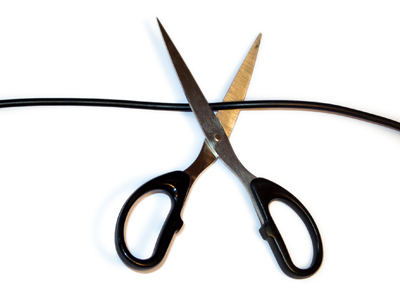 As you may recall, I've been looking for ways to reduce expenses by finding alternatives to the monthly cable bill. In the first part I managed to use a simple antenna to bring in local HD digital content. If you're looking to do the same, I recommended using this guide to locate where your local stations are being broadcast from to determine if there's anything in the way and what kind of antenna you might need. So now that I have local news, sports and weather taken care of, what about the rest of the cable and satellite offerings? That's where the internet comes in. 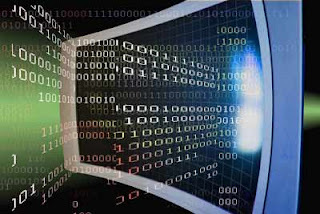 If you have a high speed internet connection, you can get "video on demand" (VOD) from an assortment of services like Netflix, Hulu and Amazon.com. Video on demand is a bit different from the way you may be used to watching TV. Instead of waiting until a specified time to watch the program you want to see, you select it and watch it immediately - kind of like popping a DVD in. The difference is that the DVD library is huge and instead of the data going over a short set of wires from your DVD player to the TV set, it's going over your high speed internet connection (note the high-speed - this won't work over a dial-up modem). What's more, streaming video on demand is relatively inexpensive compared to the monthly satellite and cable fees. Basic Netflix is $8 a month for as much content as you care to watch during that month. And nothing to mail. The trick is to get them from your internet to your TV set. If you have a gaming system like XBox 360 or Nintendo Wii, you can use them to get Netflix right now. If you don't, there are other devices you can use, like Apple TV and Roku. What you decide to use is entirely up to how you intend to use the device. Remember that it's more like getting access to the world's largest video store and not a TV tuner like you are used to. That being said, I decided to give Roku a try, mainly because it was relatively inexpensive compared to the other options (Roku starts at $55) while still offering full HDTV content. Roku itself is not a subscription service, but it does give you access to free and "premium" content. Like your TV antenna, Roku does not control the content, nor does it determine the fees for the content you choose. So choose carefully when you are making your decision. The two main premium "channels" for Roku are Netflix and HuluPlus. If it's on DVD, it's likely on Netflix. HOWEVER, not all of Netflix content is available for streaming. Latest releases and the biggest blockbusters are likely to be withheld from Netflix streaming. Don't ask me why, but if I had to guess, I'm thinking it has to do with the major studios and their endless pursuit of the almighty dollar. However, if you really want to get your hands on that content, you can upgrade your Netflix account for an additional $2 a month and get those DVD's mailed to you. But if you're stingy like me, just go to your local library. Most local libraries allow you to put an item on hold (books, CD's, Movies, you name it) and they'll let you know when it's available for you to check out. Another option available to Roku users is Amazon Video on Demand. This is like having a video store inside your TV set. The latest movies and episodes of TV shows are available from Amazon for a fee (usually $.99 per episode of a TV show - more for movies or seasons of a TV show) and that selection is added to your Amazon library for viewing whenever you want. It's not free, but it's an option for something you just have to see. Yet another option for Roku users is HuluPlus. The difference between Hulu and HuluPlus is that (A) HuluPlus is HD and (B) HuluPlus DOES NOT have the most recent episodes of most TV shows the day after it broadcasts. As with Netflix, I'm guessing the reason for this discrepancy is the need for the broadcasters, studios and cable providers to push their system of delivery over that of HuluPlus. So, standard TV resolution over the internet: OK, HDTV resolution direct to your TV: NOT OK. Still, I'm hoping they'll get this worked out soon. So with an antenna and Roku delivering Netflix and HuluPlus to my TV, I now have a lot more content being delivered. But there's still a few gaps. I'll be discussing how I managed to get the rest of the streaming internet content on my TV in the final part of this series. Let's face it, subscription services like cable TV have invaded our lives. Those subscription costs add up and we've been convinced that they are a necessary evil. Even though we don't spend as much as some folks on these services, our annual contribution to satellite, cable, etc. would easily buy a nice TV to watch all of that subscription content on. I'd heard about "cutting the cable" but I had two concerns - the first was about the quality of "alternative" content and the second was how I might manage without the handful of programs that I'd grown accustomed to seeing on a regular basis. It turns out that things went a lot easier than I imagined. First of all, let me state that while things worked well for me, your mileage may vary. The type of TV you have, the quality of your internet connection and where you live all have an impact on your results. But more on that later. The plan was a three pronged approach - antenna for local broadcast, streaming video for "cable" content and computer input for anything else. I'll start with the antenna. If you're like me, you're familiar with the old "rabbit ears" used to get TV broadcasts. And you're probably also well acquainted with the "snow" that accompanies a weak signal. Let me state that those days are gone. If you have a digital TV receiver (this is essential - analog won't cut it), then any broadcast you get over the antenna is either going to be crystal clear or not there at all. That's because of the nature of digital TV. All of the data gets delivered and processed, missing bits are automatically corrected for and therefore, no snow! However, if too much data gets lost, the image and audio stutters and eventually disappears all together. There really is no middle ground. We are fortunate to live within 20 miles of the broadcast towers in our area, so we can get by with an indoor antenna. We get all of the content from the 5 major broadcasters in our area. When I say all, I mean all. That's another little "bonus" of digital TV. There are additional channels. One broadcaster is sending out 24-hour weather broadcasts in addition to their regular broadcast. Another has added music videos to their broadcast. And PBS has 3 additional channels of content in our area! Seriously, if I had known it would have worked this well, I would have done this a long time ago. So no more need for cable for local channels. But what about the cable channels? I'll cover that in a subsequent article. 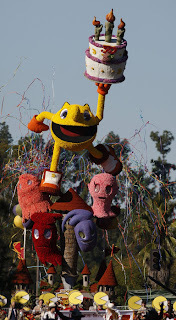 Even though I thought the actual date was earlier, Namco is declaring 2011 to be the 30th anniversary of Pac-man and to commemorate the event, they commissioned a towering likeness of the popular character for the 2011 Tournament of Roses parade. I must admit that I do not understand the significance of the castle or the grey candles, but hey, it's all fun. The float was preceded by a marching band with the familiar "pie wedge" icon covering the tubas. My first encounter with Pac-man was in the late 70's when I saw a couple of girls playing a "cocktail" version of the game in a local arcade. They were thoroughly engrossed in it and what little I could see by peering over their shoulders caught my eye. It was a simple idea that was easy to grasp and instantly addictive. I was envious of other players who became experts at the game, because I could never get past the first few levels. Coincidently, this weeks cartoon features the iconic videogame character. But I'm sure you've already enjoyed it and commented on it, right?